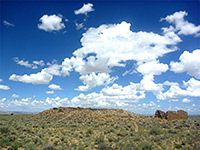 The South Mesa Trail is the least popular of the four main hiking paths in Chaco Culture National Historical Park since it is relatively long (4.4 miles) and there is only one ancient site along way; the crumbling backcountry pueblo of Tsin Kletsin. 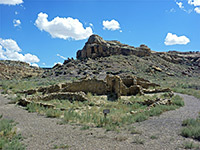 Unlike most villages in the park which were built along canyons, Tsin Kletsin sits on a flat plateau on the south side of Chaco Wash, and dates from the 12th century. 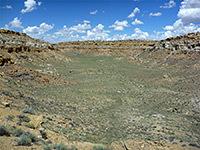 The site is unexcavated, and relatively small, 200 feet across and originally containing about 80 rooms and three kivas, of which only one is clearly visible today. The ruins are reached by a loop trail; the east section climbs the cliffs behind the roadside ruin of Casa Rinconada and runs mostly across the plateau, while the west section follows the wide valley of South Gap and then a side canyon, before ascending a little more steeply and veering east towards the village. The loop can be hiked in either direction though anticlockwise is perhaps best as most of the hike is completed before reaching the ruins. 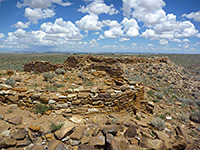 The trail begins at Casa Rinconada, on the south side of scenic drive, a site that is also rather less visited than the larger and better preserved ruins to the north. 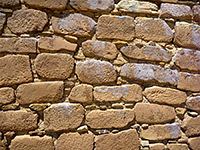 There are four groups of rooms here; the casa is a well preserved great kiva, and a short loop trail leads first to here, then passes another three well-defined ruins to the east, known by the designations BC50, BC51 and BC59. The trail to Tsin Kletsin forks off this short loop to the west, following an old vehicle track that soon curves south away from the main canyon, and up a wide tributary valley (South Gap), which is grassy and rather featureless. A path forks southeast after about a mile, running along the floor of a side ravine, lined by layered cliffs, as the main valley becomes even wider and shallower. The ground rises moderately steeply at the far end of the valley, up to the rim, which is about half the height of the extensive plateau ahead; the second half of the ascent is up several stepped bands of sandstone, colored various shades of light grey, brown and purple, eroded into shapes and cavities. Some thin, black coal strata can also be seen. The trail winds through little gullies to the grassy flats on the mesa top, followed by a very gentle rise over sandy land to the ruins, built at a minor highpoint of 6,658 feet. Around two dozen rooms can be identified, in two groups on the north and south edges, and some neat patches of brickwork remain, in a subtly different style to those on the valley floor, though most are quite weathered, and the highest wall is only a few feet. Views are of desolate, empty land in all directions, with no prominent landmarks. 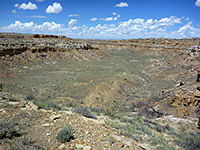 The return part of the loop is due north, then slightly west as the mesa starts to break up at the edge of Chaco Canyon. The trail follows several small drainages, passes through a narrow gap at one point, and soon comes within sight of the park road, descending back to the south side of the Casa Rinconada loop.